Here we are again. It’s that time of year where I say predictable things like “What? How is the year almost over?” or “The holidays are chasing me down and I feel like I can’t breathe–can you pass me that paper bag to breathe into? Thank you.” Oh, was that second thing not as predictable? I dunno, it feels about right. The holidays are filled with a lot of joy, but they can also fuel a lot of stress and panic. For me, I’m pretty much always traveling on a holiday to get to family. So, a lot of the stress is logistical. I also get stressed out because my birthday is very near Thanksgiving and I’m getting old and I don’t want to feel my feelings–but that’s an entirely different post that isn’t centered around meatballs or topped with anything like gravy. This here is a post that is meant to make things easier on you. This is for the human who doesn’t feel like defrosting a turkey. This is for that time we tried to cook a turkey in my Grandma’s oven when only half of it was working, and half the turkey came out raw (oy). This is for a Pre-Thanksgiving bash with friends, where you want to serve something that tastes like the holidays, but don’t feel like sweating a lot. Basically, this recipe is for you. Use it when you want to eat holiday food smothered in gravy, but aren’t feeling up to the task of wrestling down a sixteen pound Butterball. It could be on Thanksgiving, it could be on a Tuesday. I don’t care. Just use it liberally. Smother things in gravy. Eat your feelings. You’re doing great. Wanna go halvsies on a bottle of red? Me too. 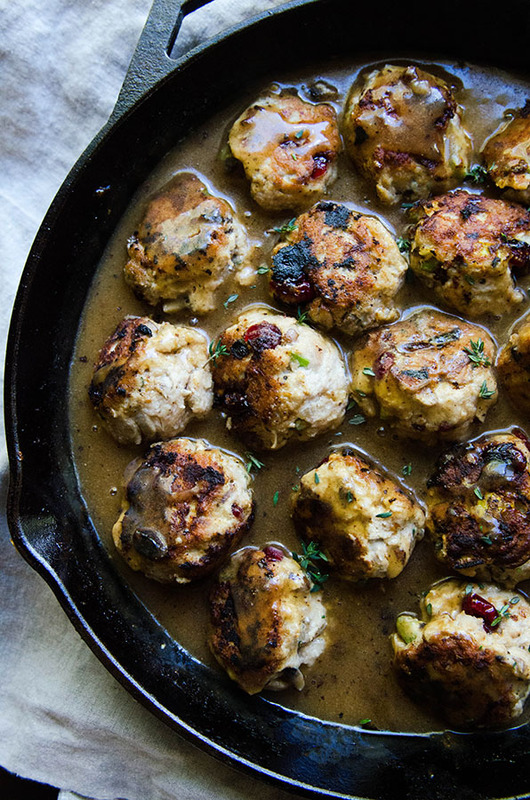 These porky little meatballs (yes, I used pig instead of turkey–you could use turkey, but trust me I’ve tried them both ways and the swine is MIGHTY fine!) are packed with all the flavors of the holiday table. 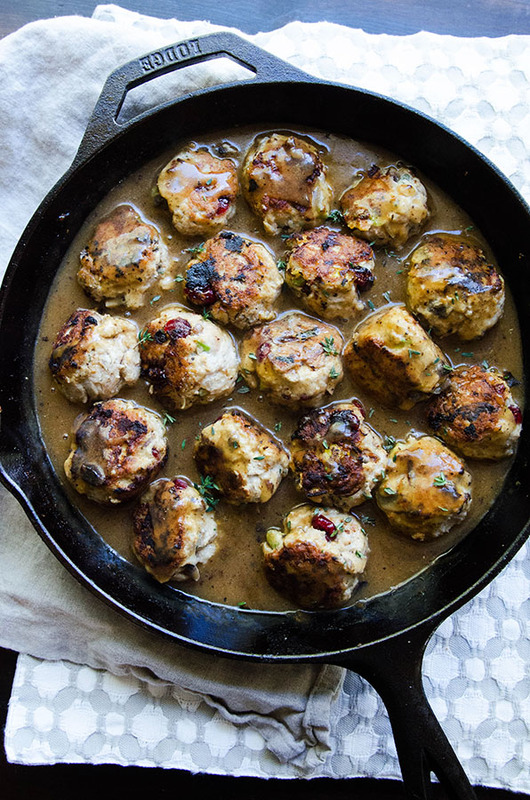 From sauteed mushrooms in butter, fresh sage and thyme, and the sweetness of tart dried cranberries–they pack a lot of flavor. Smothered in gravy, they are even better. Served along with stuffing and cranberry sauce? STAWP. Is a meatballgasm a thing? Because, even though it sounds pretty gross and weirdly graphic, I feel like it might be appropriate here–though, I’m often mistaken in these matters. But, yeah… I’m about to have a meatballgasm in my mouth with a side of gravy. No. I hear it now. I hear it now. No. Unsubscribe. I get it. You can just leave me here with my really inappropriate sentences on gravy. I’m so sorry. Writing about balls and gravy isn’t that easy, guys. It’s just not. You know what IS EASY(check out that flawless transition, btw–nailing it)? 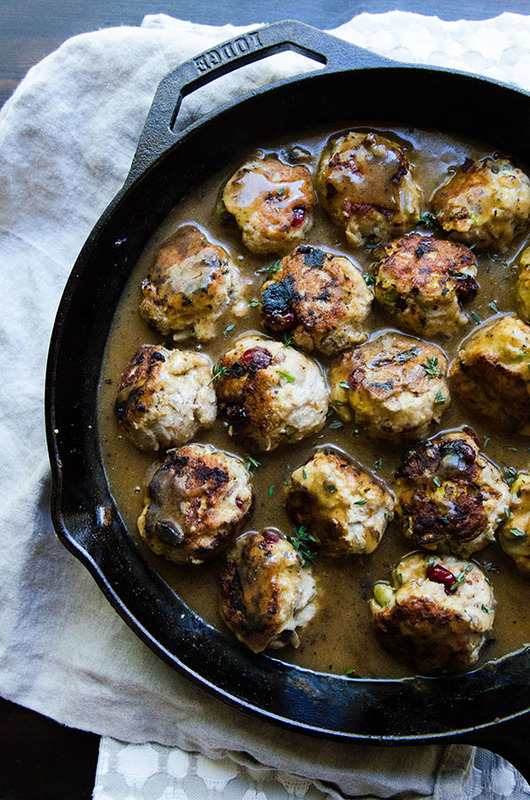 THESE MEATBALLS. 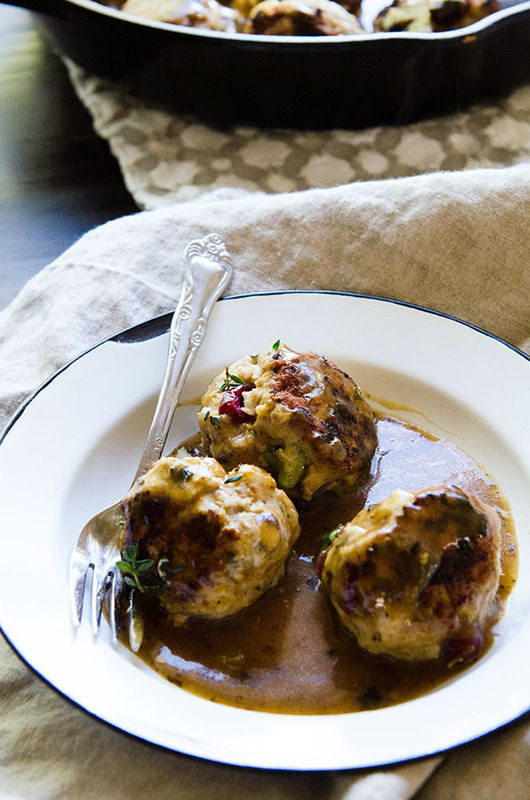 They are easy and yummy and holiday and come with gravy. I don’t know how many other ways to sell this. I just want you to be as excited as I am about these little babies. I want you to feel a sense of relief as you place them on your holiday table. I want you to have less dishes because this really only uses one pan. I want everything for you, dear reader. I really do. So, plate up. (meat)Ball hard. Fist bump. We got this. Errything is gonna be gravy. All the flavors of thanksgiving dinner, without the hassle of defrosting a turkey! Heat up a cast iron skillet over medium heat. Once the skillet is hot, melt the butter or ghee in the bottom of the pan. Once the butter is melted, add in the onions and garlic and saute them for a couple of minutes until the onions are translucent and the garlic is fragrant, stirring occasionally. Add in the mushrooms and allow to cook down with the onions and garlic. The mushrooms will cook down and start to brown a bit in the butter. Move this cooked mixture into a separate bowl to cool down a bit while you start mixing the meatballs. In a large mixing bowl, add the ground pork, chopped celery, the steak seasoning and the chopped herbs. Mix well with your hands until the spices are incorporated throughout the mixture. At this point, you can add in the cooked down mushroom mixture and use your hands to fold it into the meatballs. The mixture should be a bit wet at this point. Add in the two eggs, the almond flour and the coconut flour. Fold in and mix well with your hands. Massage the meat so that the ingredients are distributed throughout. You do not want dry patches of flour in your meatballs, so really mix it well. Add in the cranberries at the end and mix through. Allow the mixture to sit for ten minutes while the coconut flour helps to firm up the mixture. It won't change a great deal, but enough for it to set a bit. Form approximately twenty meatballs, using your hands to roll them out. Set your rolled balls aside and wash your hands. Heat up the same cast iron skillet you used to cook the mushrooms and onions over medium heat. Add enough avocado oil to coat the bottom of the pan generously. Approximately two tablespoons or so, maybe more. Allow the oil to heat up until it sizzles when you flick a bit of cool water into the pan. Using cooking tongs, or a slotted spoon, add the meatballs into the pan 10 at a time, cooking in batches. Allow the meatballs to cook uninterrupted for five minutes on each side, or until cooked through. Check one of your meatballs before removing them all from the pan. The meat should no longer be pink and the juices should run clear. Set aside this batch of cooked meatballs on a clean plate with a paper towel to drain. Cook the second round of meatballs the same as above, adding more oil to the pan if needed. Once all of the meatballs are cooked, you can start on the pan gravy. Add the three cups of turkey stock to the pan you cooked your meatballs in. Allow it come to a boil. Once it boils, turn the heat down and allow it to simmer. Using a spoon or a spatula, scrape the cooked bits of pork and seasonings from the bottom of the pan. This is going to help add flavor to your gravy. Ladle a cup worth of the hot stock into a large measuring cup. Now, add one of the tablespoons of the cassava flour to the hot stock and whisk immediately. Whisk it very well, so there are no lumps. Now, repeat again with the second tablespoon. Add this thickened stock to the rest of the stock in the hot pan and whisk together in the pan. Allow this mix to simmer and thicken. If it does not seem to be thickening up to your liking repeat this over again, ladling a cup of the hot stock into the measuring cup and adding a tablespoon of cassava flour, whisking, and adding back to the pan. The two tablespoons were enough for me, so you might not need to do it a second time. Just pay attention to your sauce, and adjust accordingly. Once your sauce is thick, add in the butter and whisk well. This is going to add richness to your sauce. Once the butter has melted and has been whisked in well, it's time to taste your gravy and adjust seasonings. Add salt and pepper to taste. 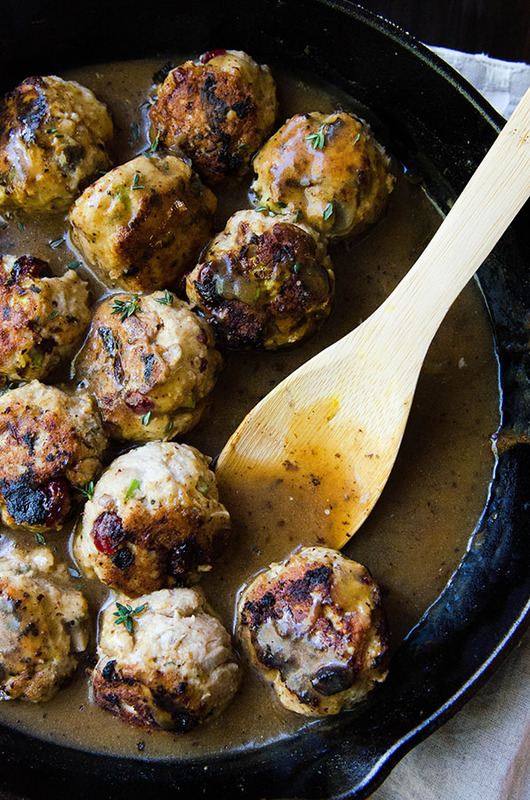 Once your gravy is thick and seasoned to your liking, add your meatballs back into the pan and coat in the gravy. Serve with your favorite side dishes and slather them in pan gravy too! Enjoy! If you're not sure about your meatball seasoning, make a test meatball. This is a good way to make sure the seasoning is up to your liking before you cook the whole batch! Tired of getting your oven all dirty when you're frying something in a cast iron? I recently ordered a splatter guard for my pan, and it's been life changing! Here is the one I use. This looks so good. I love sage and all the other flavors too. Definitely going to give it a try!